BCF : Many believe that if only Israel had not been created from Ottoman land, if only the Muslims had continued to rule then the current problems would not exist, but what was life for Jews under Muslim rule? Look at the atrocities done against Jews in 1934. The main ideologist of Turkish Islamists in Turkey of those days, dominated demonstratively by one party, one nation, one language, one religion and one leader, Cevat Rifat Atilhan. 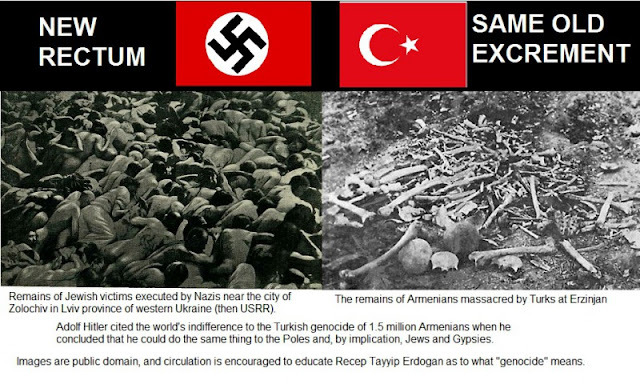 With the aim of attracting greater favour of Nazi Germany, he distributed the Hitlerian Crosses to all students of the University of Istanbul, he passed them out himself, together with his followers, and ordered all of the students to wear them. You should not forget that the University of Istanbul was the most important Turkish university of those days. Some of the Jewish intellectuals were too naive. They wrote an official application addressed to the Turkish government asking to stop the hateful campaign against Turkish Jews, run by the pro-governmental or even governmental magazine “The National Revolution”. The Jewish community in Turkey, in despair and fear of the coming pogroms, approached the Prime Minister Ismet Inönü himself and to the Minister of Interior Affairs Sükrü Kaya and appealed for protection provided by state authorities, against the attacks by crowds, goaded by mysterious forces… The appeal was never answered.